Iron and steel are similar metals. Fundamentally, the difference between these two materials is that they have different amounts of carbon in them. Both can create sturdy, though expensive, fences. However, their differences are enough to make choosing between them difficult. They have different strength levels, versatility and appearances. 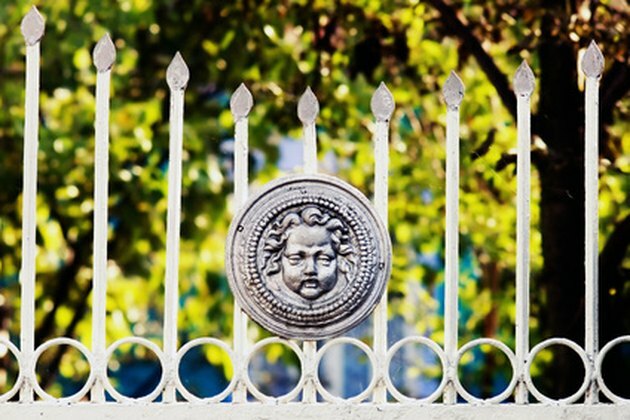 Steel fences are more easily molded into ornate designs. Both iron and steel are hard materials that can make durable fences. Iron fences are only made up of iron, while steel fences contain both iron and carbon. The lack of carbon makes iron softer than steel, which makes iron less durable, requiring more frequent repairs. However, iron can resist shock and vibration. Also, when iron fractures, the breaking occurs gradually, warning fence owners to replace the fence. When steel breaks, the material breaks suddenly. This can create problems on the edge of a hazardous fall. The steel fence is more likely to break suddenly when struck by a powerful force. Since iron is easier to mold and work with than steel, welders will have an easier time making designs and railings. However, welders typically use mild steel for railings. This material is iron with a small amount of carbon, which makes the fence somewhat stronger. But steel that contains a lot of carbon heats up easily, which will require less electrical energy when welders work with the steel. The production difficulties associated with iron raises its price. However, both kinds of fences are more expensive than wooden fences. Steel fences are fabricated more quickly than iron fences, speeding up the steel fence's production time. Iron fences rust more than steel fences. Rusted iron gates can get stuck more easily and might require lubrication to open. Stainless steel has nickel and chromium mixed in, which makes the steel more resistant to corrosion, so the fence won't rust or change its appearance. Without these materials, steel will not last as long as iron. The steel fence has a more sleek and modern appearance, while the iron fence looks more old fashioned. When iron and steel fences are heated by a fire, they will both produce a little heat of their own. However, the iron fences will produce more heat than the steel fences. This heat conduction can increase the likelihood of fires, but not as much as many other fencing materials such as wood.